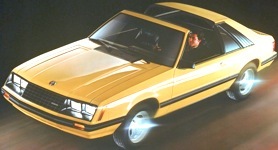 New to 1982, was the Mustang GLX which replaced the previous years luxury Ghia options package. The GLX has "blackout" treatment on exterior window trim and door handles; optional non-functional hood scoop; P185/75R14 BSW performance tires; 6 spoke cast aluminum wheels, 5.0 fender badges; 157hp 5.0L V8 engine and GT handling and suspension; GT dash instruments; reclining low bucket seats; blackout dash; and optional console with armrest, electronic digital clock and graphic display systems monitor. The new 1982 Mustang line-up of base level L, GL upgrade, luxury-sport GLX, and sport GT was created to follow the European naming standards for easier export. This is a Ford promotional photo of a Medium Vanilla 1982 Mustang GLX 2-door coupe with cast aluminum wheels (16 slot), body side moldings, and color matched window trim and rear quarter window louvers. The Ghia luxury package which ran from 1974 to 1981 was renamed the GLX in 1982 and remained until 1983. This photo was used in the 1982 Ford Mustang promotional booklet. Ford promotional photo of a Medium Gray metallic 1982 3-door GLX hatchback with t-tops in the upper left. This car is featured in the 1982 Ford Mustang promotional booklet. The Ghia luxury package which ran from 1974 to 1981 was renamed the GLX and was changed to SVO in 1983.